14-16 jumbo pasta shells cooked according to package directions. For slow cooker method: Pour and spread 1/2 cup of sauce evenly in the bottom of a crock-pot. Thank you! Check your email for a confirmation link. Add lifemadesw[email protected] to your email contacts so that you don't miss it. Once you confirm, you'll receive a link to download the printable! I love a cajun twist on anything, as it’s one of my favourite flavours. This looks really delicious Kelly and just goes to show what you can do with a tin of soup! Mmm I can almost smell this through my computer screen, Kelly! It looks amazing! Campbell’s soup is my favorite and I’m loving that you incorporated that into these stuffed shells. Sounds like the perfect comfort food meal! Love that this is a crockpot meal! And stuffed shells are always so fun to eat!! Kelly, I love this idea for the slow cooker!!! We love stuffed shells!! 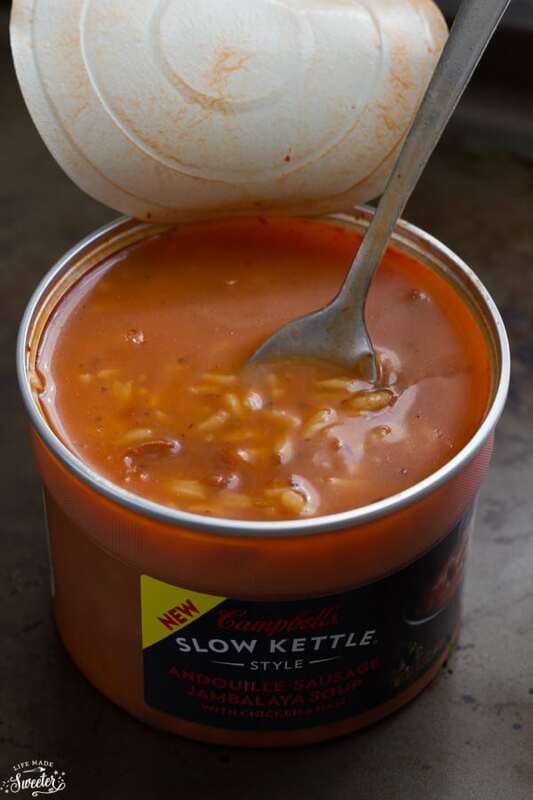 and can’t wait to try the Campbell’s Slow Kettle Style soups! this looks so delicious! I love those Campbell’s soups! I keep the pantry stocked with them. How creative to use them in a slow cooker jambalaya. It sounds delightful! This is such a cool idea Kelly! Love these stuffed shells! Need to try this asap! Pinning! The flavors of this sound amazing Kelly! And I love that you made it in a slow cooker. Love! Oh my goodness Kelly! These look like the best shells ever! I love jambalaya! What a great idea for a slow cooker meal! Love this! Such a great comfort meal! The rice pumpkin filling sounds really great, Kelly. Oh I LOVE stuffed shells Kelly! I want, I want, I WANT! These look gorgeous! OK I must try this recipe, those shells look so juicy, so delicious, so hearty! Like I am losing it only by looking at these gorgeous pictures! The shells look amazing and so perfectly stuffed!! Yum! 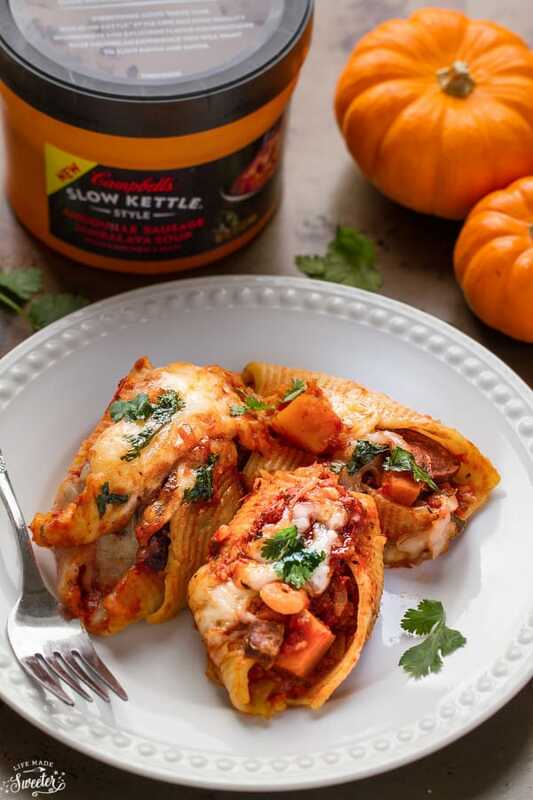 These stuffed shells look like the perfect comfort food for the chilly weather! Love the addition of the pumpkin with the jambalaya flavors – so creative! How did you think of this! Such a great, smart idea. I would never have thought to use soup filling but it looks great. Stuff shells always make me think of being a kid and I bet this was very welcomed at your family table. This meal combines everything that I love about comfort food – pumpkin, pasta and jambalaya! I would love this on my dinner table tonight. Thanks for sharing, Kelly! You make me hungry every day! I love jambalaya and I need to try these stuffed shells. Campbell’s soup? That’s so cool! I’ve said it before and I’ll say it again: I always look forward to your slow cooker recipes! They’re so great for a crowd or just a couple really hungry people. 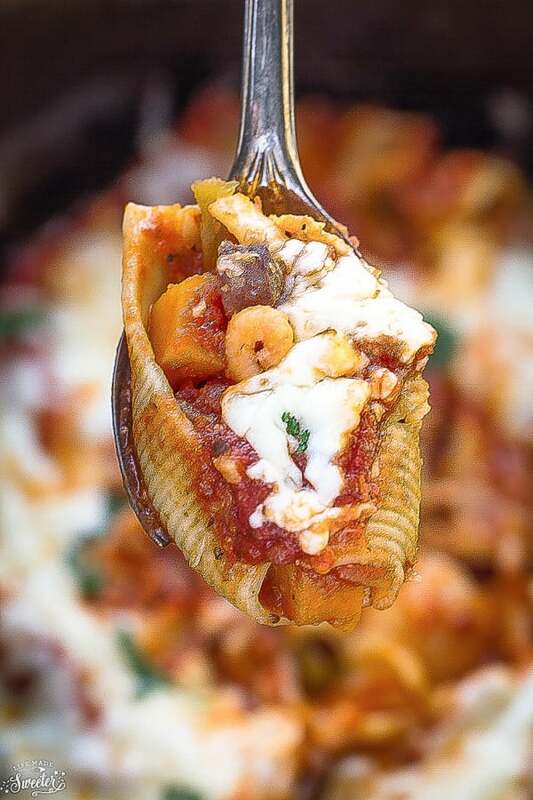 Jambalaya stuffed shells is a great idea! This is a substantial, delicious meal, and the pumpkin puree is such a nice touch. I love it, Kelly! Pumpkin, jambayla, and stuffed shells? Whaaattt? Girl, you are a mastermind of culinary creativity! 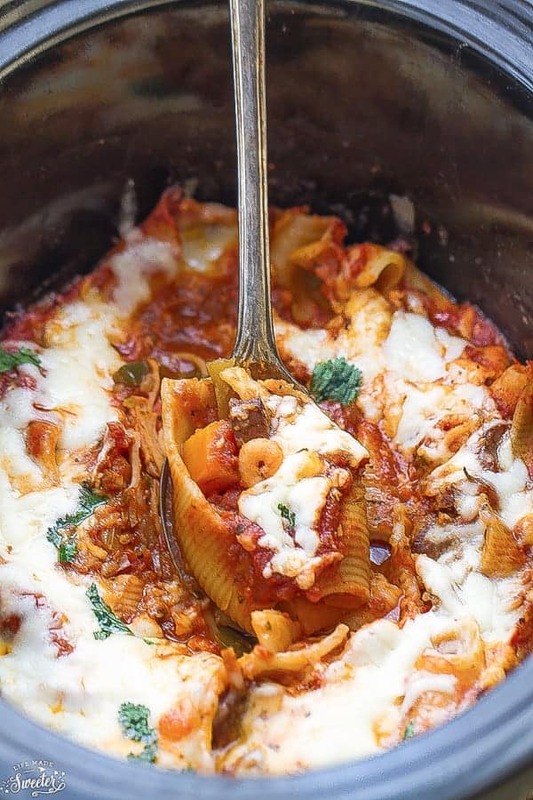 Love the flavors of this recipe, but I mostly love that you made it in the slow cooker! You are busy with your little ones — it amazes me how you get so much accomplished on your blog. 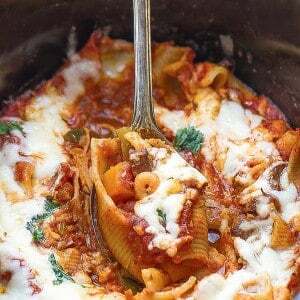 🙂 Your slow cooker meals are always so great, and I love the looks of these stuffed shells! Great flavors, Kelly — these look delicious!